When considering where to find affordable ski resorts for families you should look no further than Peisey-Vallandry as it is part of the Paradiski Ski Resort and has an array of other inexpensive family-friendly things to do and places to eat. You have direct access to the ski resort by walking just a short way through Peisey village to the famous ‘Lobster Pots’ lift, which can take four people at a time. 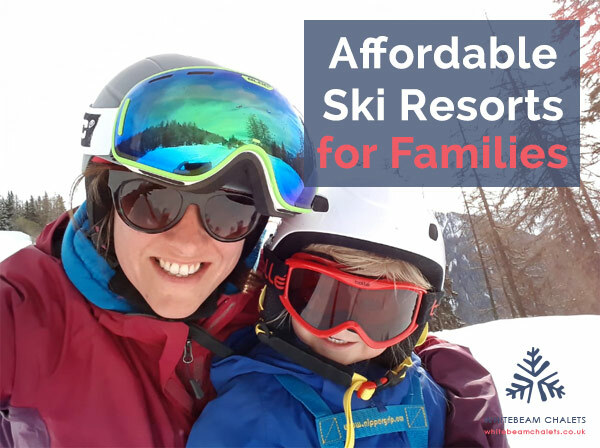 Whether you’re going to a ski lesson or the creche, or maybe you have your sights set on the higher slopes which you can access using the Peisey lift, you’ll be well on your way to getting the most value out of your family ski holiday. Paradiski ski area is made up of three affordable ski resorts for families, Peisey-Vallandry, Les Arcs and La Plagne, which are linked by the the Vanoise Express – a double-decker cable car. Paradiski ski passes can be organised for guests of Whitebeam Chalets so they will be ready for them upon arrival at your affordable ski holiday accommodation. Peisey-Vallandry is also host to other affordable winter activities such as guided tours of heritage sites near Vanoise National Park, horse sleigh rides, feeding reindeer, and snowshoeing. Whitebeam Chalets can tailor their guests’ ski holiday to their needs and budget, and can also organise lift passes, ski lessons, transfers, babysitting services, yoga, massage, and provide more information about the area. Paradiski resorts have many dining options open for lunch, dinner, or drinks, including buffet-style restaurants, traditional cuisine, gourmet à la carte, and on-piste ski-in, ski-out bars. Alternatively, guests of Whitebeam Chalets can have a packed lunches arranged with the chef to take with them up the slopes. For an affordable but impressive dining experience during your ski holiday, visit this gorgeous boutique restaurant, Le Petit Hibou (which means little owl), based in a traditional alpine house surrounded by mountains. It’s open for brunch and dinner, serving beautiful food and beverages (as attested by all their 5 star reviews!) including such delectable menu items as: Ricotta pancakes with berries and whipped lemon butter, Chermoula chicken with roasted veg and spelt salad. After hours on the slopes you can quench your thirst with one of Le Petit Hibou’s refreshing cocktails such as the Hugo – made with St. Germain elderflower liqueur, prosecco and fresh mint. The restaurant is easy to get to by bus from each of our chalets, and it’s within walking distance from Chalet Cairn. As guests at Whitebeam Chalets catered meals can be lovingly prepared for you by your personal chef six days of the week, and served with locally sourced French wine. There is also a menu especially for the little ones which includes yummy food such as roast chicken dinner, homemade pizzas, cottage pie, homemade burgers, spag bol, and pesto bacon pasta bake. For reasonably priced accommodation in Peisey, there are two family chalets which are great value for money and meals can be catered for the family, including wine and beer at dinner, and a kids’ dinner menu which can be served at an earlier time if requested. Firstly, there is Chalet Bronziers which is a charming 300-year-old converted farmhouse in Peisey village which has 5 spacious bedrooms suitable for affordable ski holidays for families visiting the French Alps. This hosted chalet offers twin, triple, and quad room options, and includes two baths for young children to use. Bronziers is made up of three spacious floors making it perfect for large families and groups with a homely open-plan living area to spread out in. While staying at this cosy chalet the kids can have their own space in the separate lounge area and have full access to the game console, flat-screen TV and DVD, and with ‘le babyfoot’ even the parents can join in the fun (and you might have a bit of friendly competition!). Bus facilities go up to Peisey-Vallandry resort area to allow you to get the most out of your time in Les Arcs ski resort. The bus stop is a convenient two minute walk from Chalet Bronziers. And when you return from your day on the slopes you can embrace the therapeutic effects of the chalet’s wood burning sauna! In addition to the 5 bedrooms, Chalet Bronziers also has a fully furnished flat underneath which can be used as part of the full chalet experience, or it can be booked completely independently for your privacy. The other family chalet is Chalet Mélèze Sud which is suitable for affordable ski holiday accommodation with its 7 en-suite bedrooms as well as a lovely outdoor hot tub the whole family can enjoy. Chalet Mélèze Sud’s large south-facing terrace gets all-day sun making the perfect viewing deck for families to take in the mountain valley scenery and relax. Other facilities of the chalet include underfloor heating, an open fireplace, entertainment system, ski and boot storage space, and free Wi-Fi. These family ski chalets in Peisey are in prime positions, with both being just a short walk through the village to the ‘Lobster Pots’ (Lonzagne lift). If it’s more lavish accommodation you’re looking for, without the opulent price tag, you can experience an affordable luxury holiday at the boutique Chalet Cairn. This 7 bedroom (with en-suites) property comes complete with a hot tub and sauna, and with views to die for of Vanoise National Park you may not even make it out onto the slopes! Chalet Cairn has plenty of space for families on an affordable ski holiday with over 3 floors of luxury facilities: on the ground floor is the master suite with gorgeous views of the valley, the second floor is where everyone can warm up by the roaring fire, watch TV or play on the game console, and the bottom floor houses the relaxation room with the sauna and access to the outdoor hot tub. This chalet also features underfloor heating throughout and a heated boot room so the family will always be lovely and toasty during their stay. Peisey-Vallandry has everything for affordable ski holidays for families – the ski resorts and other reasonably priced things to do makes it the perfect place to go for your next ski trip.